Which is your favourite war sitcom? Allo Allo, Dad's Army, Black Adder Goes Forth...there are many sitcoms about war. Which is your favourite? I have a really tough time choosing between Black Adder and Dad's Army because they are so vastly different. One is satirical, and the other loveable. I think it depends what sort of mood I'm in. I never realized there were so many war sitcoms, I'm pretty sure the only one I've ever seen is M.A.S.H. and I liked it. You don't tend to notice how many there are until you actually start to count them up. I don't watch much television at all these days but I used to enjoy Dad's Army and Hogan's Heroes. Did you know lead actor in hogan's hero turned out to be a nasty person in real life? 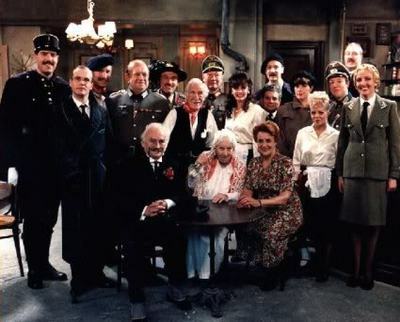 Allo Allo, I need to go on Youtube now and find an episode. This show was all about the 'heart throb' Renee. Which Dickens character would you like to see Gillian Anderson play next? Which sports do you wish were televised? What sort of cartoon would you be in? Do you watch shopping channels?